Have I said often enough that “I don’t fry?” Ok, I take that back. When you live in one of the most overcast, drizzly, damp cities, sometimes you need to fry just to have some fun and warm you up. Once in a while an exception is ok, if you eat in moderation and don’t go crazy! In India we fry bhajias during monsoon. I only wish that every time we fry, it could recreate the charm of monsoon! For me, the best part of frying was learning how to fry from my mom, because it brought back that nostalgia — hers and mine! I learnt about her quirky techniques, and she remembered learning to fry when she was growing up, or remembered stories from when my brother and I were young. We talked about “Mohan’s bhajias,” the one-man business in my hometown whose thinly-sliced potato bhajias were simply the best! Mohan had a small hand cart which he parked a few blocks away from our home. Whenever some of my out-of-town cousins would visit us, we’d wait in long lines to get Mohan’s potato bhajias, because that’s all our guests wanted. My mom remembered how it was her dad who taught her to fry, and she was so afraid of making mistakes. She made the same mistake I was making when she taught me; then she’d say — you get the hang of it as you do more, it’s all about practice. For me, it’s not quite the case because I don’t fry often. For me, frying has always been associated with scary things. There is something scary about hot oil flying all over, like the first time I decided to make corn fritters. Mostly though, the fear I have of frying is because I’ve lost a lot of my family to serious cholesterol and heart problems. I’d hate to see more fall victim to eating too much fried food. On the other hand, I admit that fried foods bring out the fun & cheer in everyone. We act like we are all happy five year olds 🙂 When I made these bhajias, my husband put a little music on and did a dance! and we made some chai, and pretended like it was monsoon, and we just enjoyed. Bhajias are like a lot of common food wherever you go — cheap and what the majority enjoy, whether in fast food chains or off the street from a little hand cart. They can take you back home, wherever you are and wherever you are from! So once in a blue moon, we fry like it’s monsoon in cold, rainy Seattle, filling up our home with freshly fried fritters of many different kinds. Since I’m only doing it rarely, I pretty much slice up everything I can — potatoes, onions, zucchini, mushrooms, paneer, cheddar, tofu, chilies, bananas, and the list can go on. Yes, paneer — as in the Indian cottage cheese. 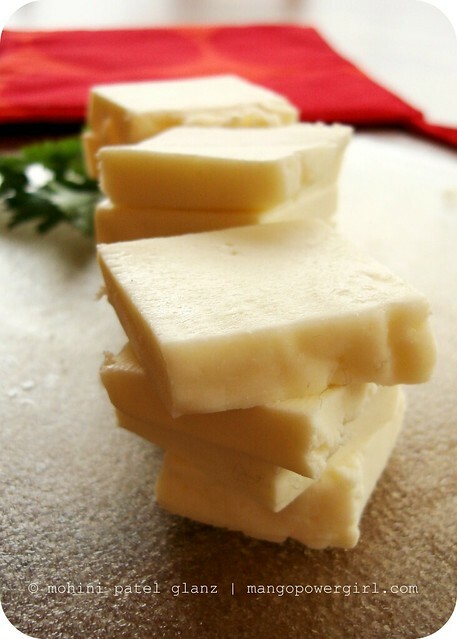 I have a local supplier whose paneer comes very close to the great home-made paneer we’re used to eating in India. There it’s made with fresh, raw, whole milk, straight from the guy who milks the cows every day, and delivered to your doorstep every day, too. Paneer-making will be another post someday, but right now Appel Farms in Washington State have done the job of supplying good quality paneer to our local grocery stores, so that is what you see here. This is the basic bhajia batter recipe I learnt from my mother. I hope you enjoy and make it your own, to share smiles and stories with your family in the kitchen and over the dining table! 2. Add the oil, and mix it in with your hand, making sure all the lumps are broken down. 3. Slowly add the water 1/4 cup at a time, while you mix the batter with your other hand to make sure you don’t get any lumps. 4. Once all the water is combined, and smoothed nicely with your hand, you should have a smooth batter. It should be just thick enough to coat any of the vegetables and other ingredients mentioned above while they are dipped and fried. 5. Make sure you have vegetable oil or other good, light oil to fry on medium-high heat. Fry as you please without crowding up the frying pan too much. I like using a small, but deep pot to fry, in which I can only put a few bhajias at a time. After you’ve dropped one in, check in a minute or so. As one side gets lightly browned, flip them over to do the same with the other side. Drain off the oil by holding them with a slotted spoon or a spider, then set them on a plate lined with a few paper towels, to soak up excess oil. 6. Sprinkle with some chaat masala or flavored salt and enjoy with a cup of chai! Such a nice post about Bhajiyas! Can see how much you miss your hometown. But you did a very neat job recreating it in Seattle! I totally understand about the whole frying thing! But these look divine…mmmm, perfect with a nice cup of chai masala! 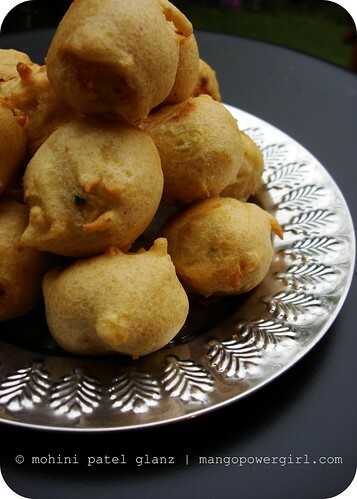 Mirch Bhajis – I had them every day while we were in India – yours look great. OMG, MPG! These look exceedingly delicious, and addictive! I love this story. Rain+bhajias+chai, I feel like I’m in a movie. I haven’t been to India during monsoon season, but I will make it a plan to go. Soon. I hope.I love Indian fried foods in general. The ones that are well made, not greasy. My favourite fast food at the moment is vegetable samosa. There’s only one place in the city that makes perfect samosas. I try to go at least every other week. I can’t believe I found another soul who “doesn’t fry” :)I just had lunch so I am not exactly hungry, but your pictures are making me drool.Also, I know what you mean about rain and bhajiya (we used to call them pako-rays) – so over here my mom and I do it when it snows :)great blog! You’ve just sparked a serious craving. I totally associate bhajias with Kenya, where my husband’s (originally Punjabi) family lives. I count mangoes up there in my favorite foods… it must be something about growing up in the tropics. Thanks for the recipe reminder – I’ll be trying these soon. Your memories associated with this recipe are lovely – thank you for sharing. My feeling about fried foods is that we can enjoy all things in moderation, and sometimes, on dismal weather days, we need a little imagination, fun, and “forbidden” treats to cheer things up! The Purple Foodie – Thanks! I miss it tons! !Peter – Thank you, we love bhajias & chai :)Seadevi – Haha! overdose 🙂 come over for dhokla ;)Cakespy – We're going to have an Indian dinner right?Cherie – LOL…my life is hardly a movie 😉 samosas…one of these days ;)Pink Dogwood – Gujuaratis call them bhajias, pakoras in north and other places…all the same 🙂 Thanks!Kitchen Flavours – Thanks! !Liz V. – We've got the Kenya connection in my family as well. I can't wait to visit one day :)Gail – Thanks! So true, some times you really do need those pick-me-ups! 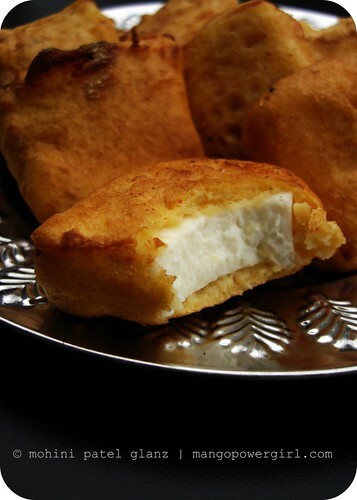 That fried cheese looks so good! Mirchi pakodas..oh my. I’m almost afraid to visit your blog because of all the nostalgia it brings back. They are so delish, 'coz they are so oozing oil. Love your Bhajias. A cup of chai and those paneer pakoras with some homemade chutney is just so right!